8.3 million people bought Harry Potter and the Deathly Hallows last Friday night. . . and they had to walk by my book to get to it. “Halverson” comes before “Rowling”, right? Now that’s exposure. Surely a few of their roaming eyes must’ve noticed Honk If You Hate Me‘s bright pink cover. . . .
It’s true that some of the 8.3 million books sold in the first 24 hours went through on-line bookstores, so it’s a stretch for me to claim that all of those bookbuyers walked past my book. But even if just half that number went into actual stores, that still puts millions of people in the aisles just a week after my novel appeared on the shelves. I can handle that. Yeah, I know, it’s probably crazy to hope for a “trickle down” phenomenon. But it’s also a lot of fun to ponder. I feel almost like a Harry Potter sidekick, imagining myself riding in on his cloaktails and happily scooping up his crumbs. It certainly beats not having my book out right now. When else would books and bookstores have such a high profile? I feel fortunate for the timing. I, myself, ventured into a bookstore on Harry Potter Weekend. I wasn’t there for our wizard friend, however. 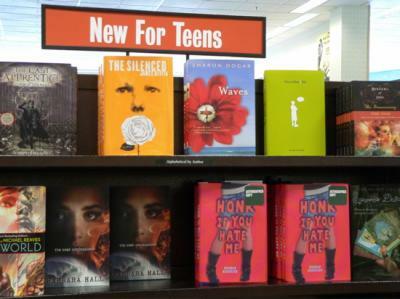 I went to the new Barnes and Noble up the street to snap pictures of Honk If You Hate Me on the shelf, geek that I am. 600 Harry Potter fans had converged on that store just hours before, and the staff was still giddy from the event, so they didn’t blink an eye when I whipped out my camera and started shooting off frames like my book was Paris Hilton strolling Rodeo Drive. 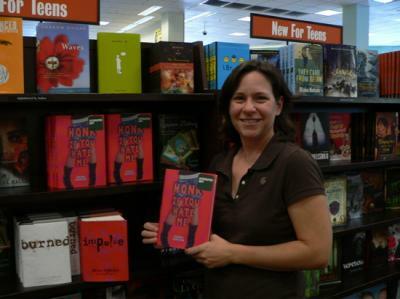 One indulgent staffer even took a picture of me next to the shelf. Oddly, she didn’t ask me for my autograph. Now I wonder, does that ever happen to J.K.? Yay! I finished your book this week Debbie and I really enjoyed it! I commend you on your wonderful storytelling ability. LOL…I’ll have to e-mail you about a couple things I found in there (you may know what I’m talking about). Good luck on your book sales! The numbers can’t be disputed, that’s for sure.